Consideration given the numbers of individual examples within each of the numerous shapes found in this pattern, one must appreciate the replacement moulds which must have been required. 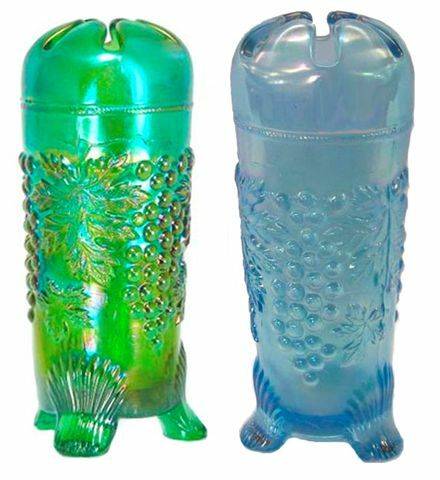 From time to time, there are discussions among collectors who find (for instance), two water pitchers of the same color, each having slightly differing features within the design. Example: One may have an extra leaf, or an additional vine placement. There are 200 pieces in a half turn and 400 in a full turn. This terminology is used in glass production. Each time a mould is used, a certain amount of glass fragment remains and must be scraped off before application of glass for another “turn”. With time, pits and gouges occur in this cleaning process. The “stippling” found on certain pieces is the result of re-working the mould to allow for further use. After a time, the mould must be replaced. In doing so, the individual artistry portrayed by the next designer will vary somewhat from the previous execution of pattern. Introduction of this pattern came in Jan. 1910. It became one of the greatest successes of all time, with new shapes added to the line over a number of years. 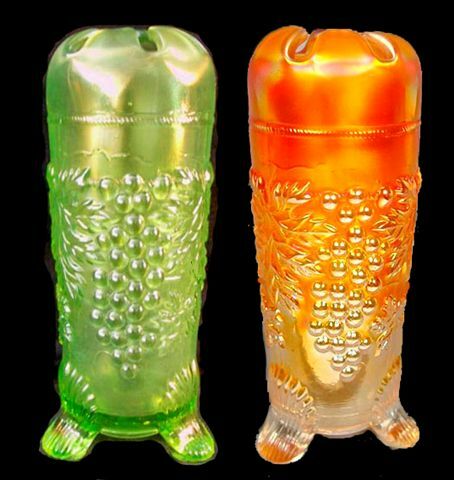 Production extended in both iridized and non-iridescent forms. More than 70 different shapes in this Grape and Cable design were created. 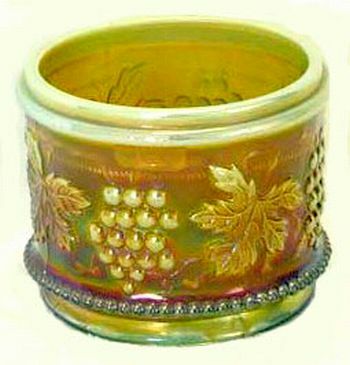 Observing the success of the design, Fenton Glass eventually produced their version of the Grape and Cable pattern. Feb. 1911-Butler Brothers Ad.Earliest ad for these two products. 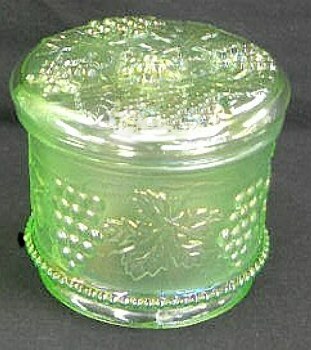 Grape and Cable Powder Jars in Ice Green and rare White. at the Bob Bishop Estate Auction - Seeck - 11-19-2005. Amethyst POWDER JARS in different designs. Dugan & Northwood. - Courtesy Alex & Sheila. Alex and Sheila have very nice amethyst examples of a Dugan Vintage (on the left), and a Grape and Cable (on the right). Northwood powder jars are identified by the presence of the cable. You will notice that the Northwood lid on the right displays a different grouping of grapes/leaves as well. There is slight difference in size between the two jars, so that interchange of the lids is not possible. 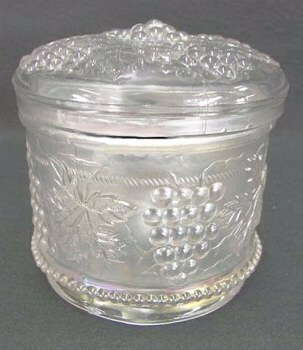 Covered powder jars were marketed individually, as well as part of the six-piece dresser set. Perfect lids are quite difficult to locate. Marigold, amethyst or green are the colors most often found. Cobalt blue and lavender examples are rare. White, ice blue and ice green are extremely rare! Only two examples in aqua opal are known to exist. Two Reproductions spotted in 2010 and 2011. REPROS: Carl O. Burns’ excellent book on Northwood Glass, printed in 2001 notes two “known” A.O. hatpin holders. He also notes that reproductions come in from Taiwan. 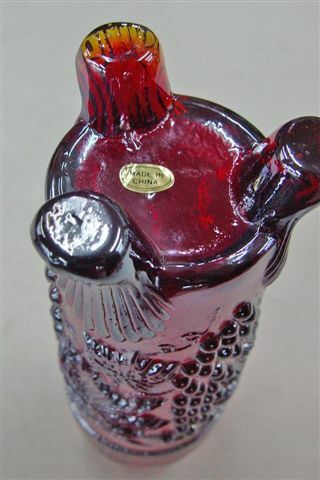 Dean took the photo of the amberina/red example with the China label, while attending our weekly preview of items to be sold at the local Christy’s Auction. The second photo displays one which was selling over eBay. It carried a bid of more than $90. at the time, with several more days to go before final sale. It is a real shame to see the mistaken value placed on such items. When longtime collectors find a re-make of sub-standard quality such as this China import, they should recognize it for what it is immediately. The sad fact is that newer collectors may be “fooled” into thinking it is a true vintage collectible. Over time, these repros. 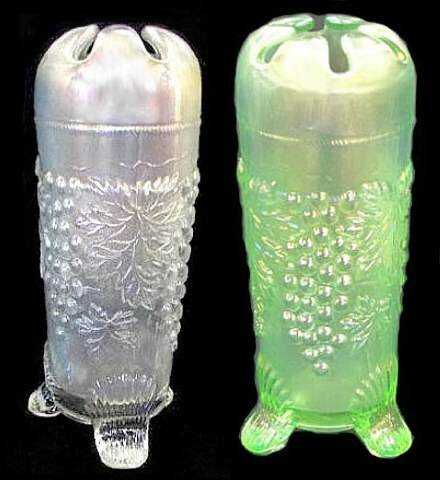 become folded into a grouping of glass and mistaken for vintage carnival glass. Experience with the glass dictates that quality in the repros. does not measure up to that of the older glass! 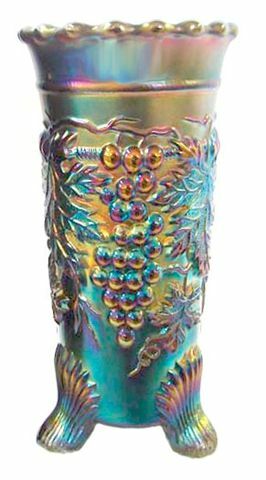 GRAPE & CABLE Hatpin Holders in Green, Sapphire and Amethyst. GRAPE & CABLE Hatpin Holders in Lime Green & Marigold. GRAPE & CABLE Hatpin Holders in White & Ice Green. 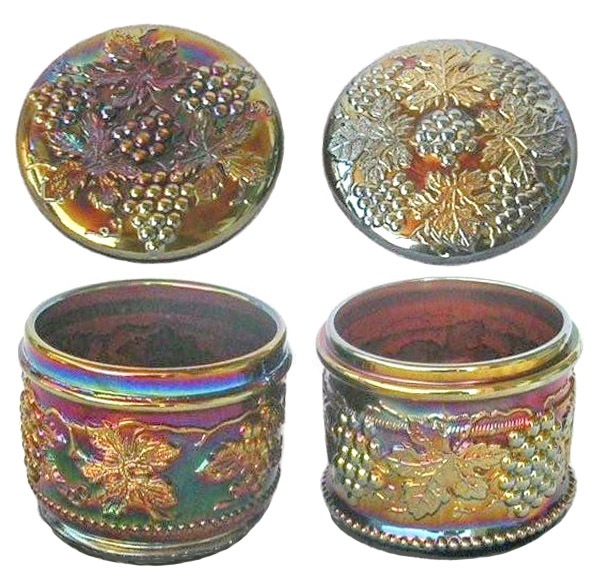 HATPIN HOLDERS: There is a banded version which displays a smooth band in place of the cable. These are found in amethyst, marigold and cobalt blue. The cable version seen in our photos are more available. Amethyst, marigold and green are seen more often than scarce black amethyst and cobalt blue. Only two examples in A.O. are confirmed. Rare colors are: lavender, white, ice blue, ice green and lime green and sapphire. Rare - brought $5500. 5-08 Wroda Auction. 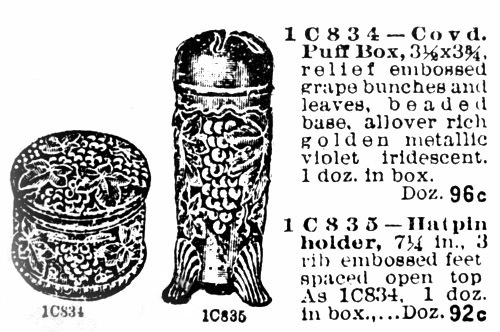 VASE, footed: Except for the tiny fluted points along the top edge, these look like the hatpin holder. Few are known, making them extremely rare. They have been reported only in amethyst and green. But God, who is rich in mercy, because of His great love with which He loved us, even when we were dead in trespasses, made alive together with Christ (by grace you have been saved)., and raised us up together, and made us sit together in the heavenly places in Christ Jesus, that in the ages to come He might show the exceeding riches of His grace in His kindness toward us in Christ Jesus. For by grace you have been saved through faith, and that not of yourselves; it is the gift of God, not of works, lest anyone should boast.